Never in my whole life have I seen a Star Wars film be so divisive amongst the community of fans and general moviegoers. 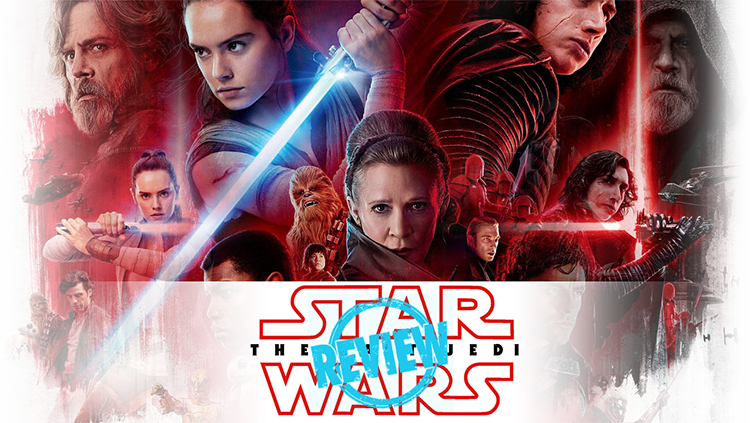 Critics seem to love The Last Jedi (TLJ) while fans seem to loathe it. Even amongst the crew here at Nerdsplain It there is division. Luckily, none of them are writing this review, I am. This may be my favorite Star Wars film since 1980’s The Empire Strikes Back. I am actively trying to be objective about the saga as a whole so I can find the right place for it in my personal best-to-worst rankings of the series. When I have that answer, so will you. If you only hear one thing from everyone around you about this movie it will be, “There’s a lot to process.” Personally, I don’t understand what they’re saying. The plot is simple enough if you’re paying attention to the movie being blasted on a 100 foot screen in front of your face. There are multiple plots playing out at once through the movie, but hasn’t that always been the case in this series? Luke on Dagobah/Han and Leia on Bespin, Luke on the Death Star/Rebel Assault on Death Star and shield generator. You get the point. Multiple stories unfolding at once is not new to cinema and certainly not new to this galaxy far far away. The Resistance is on the run from the First Order. The First Order is able to track them, however, so the Resistance can’t actually escape. With precious little fuel and no way to shake the First Order they appear to be fighting a losing battle. Finn stumbles upon an engineer and together they find a way to lose the First Order’s lock on them. Having found Luke, Rey must now convince him to join the Resistance and help put a stop to Kylo Ren and the First Order. She also wishes to know more about her apparent connection to the Force. Luke is hesitant to do either. These are the main plots. Within them, yes, there is a lot to get them from their inciting incident to their ultimate denouement. Some will argue that part of these narratives are unnecessary, overly long or overblown, however, I preferred this to the events having happened in the background prior to the film à la the Rebels having the Death Star plans in episodes IV and VI. The Last Jedi is a science fiction film that seems to follow a trend in the genre in recent years of intelligent sci-fi. Examples of this would be Ex Machina (featuring both Oscar Isaac and Domhnall Gleeson), Arrival, Interstellar and The Martian. In this regard, I very much appreciated TLJ for not being a standard fare popcorn-flick. You won’t need to try to fill in any story gaps with this one. Narrative paths from Point A to Point B are fully fleshed out. Speaking of the narrative, not nearly enough can be said of my appreciation for character arcs in this episode. So many character arcs are complete within the film itself, which saves it from the issue so many middle-child sequels get nowadays wherein they are clearly just setting up for plot points to be resolved in the next episode. Character arcs have a definite beginning, middle, and end/resolution. We see Luke overcompensate for what he believes is the hubris that led to Kylo Ren’s turn to the Dark Side. This same belief is what has kept him in isolation from the rest of the galaxy so that he could do not further damage. He openly states that he believed his own legend and it led to the most dangerous threat to the galaxy. As his story progresses we see him come to accept how the legends about him are a great strength that can inspire people across the systems to take action against their would be dictators. Ultimately, his final scene is one that anybody on the battlefield would tell everyone they know about and thus create a legend. We see this in the final scene of the film as slave children regale one another with his exploits. This is a complete and very satisfying character arc. We also get to see a very complete arc with Poe Dameron. As the film opens he is still the brash and wise-cracking ace pilot for the resistance that we met in The Force Awakens. He almost seems like he’d be a replacement for Han Solo. However, Poe is quickly made to face the consequences that his thoughtless, albeit action-packed, exploits create. When he goes off on his own and disobeys orders due to his inability to see the bigger picture, lives are lost and the Resistance is weaker for it. As the story progresses we see him become slightly more hesitant to go into a situation guns blazing until finally Poe himself is stopping others from making a mistake that he would have made 2 hours ago. In this we see a character arc that fully displays real growth for the character. By far my favorite performance came from Adam Driver in his depiction of Kylo Ren. Gone is the “emo Sith,” of Episode VII in favor of a more contemplative character that is fully portraying the struggle of his alignment to the Force and the consequences of his actions from the previous episode. Driver takes us through the ups and downs as he weighs his options between loyalty to his current master and what he feels could be the right thing to do. Conversations that take place across lightyears between himself and Rey are deftly performed. Driver showing a bit more dimension than Ridley in these particular scenes, but that’s not to say that Daisy Ridley is not worth watching. Speaking of which, Rey. I’m sure fans may be upset that the question of, “Who are Rey’s parents,” had, what appears to be, a less than stellar answer at first glance. Nobody. Her parents were nobody special. Again, this is a bit more satisfying in the long run than one might think. By breaking Rey away from the Skywalker bloodline (which would not have made sense anyway) we are given a universe where anybody can be a Jedi. Gone is the genetic lottery of being born with the right amount of midichlorians. Now, anybody with the dedication and hope of being a Jedi, or even just a Force user, can. How many of us grew up watching these movies thinking of how great it would be if we could use the Force? The Last Jedi instills the hope that we can. Additionally, who would have been the logical choice? Did Luke forget having a daughter the same way that everyone seemed to forget that Anakin made C-3PO or that Obi-Wan forgot that he’d worked with R2-D2 for decades? Did Obi-Wan have a kid well after he was dead, implying the Force ghosts are capable of copulation with the living? That’s a can of worms we do not want to get into. Did Han and Leia have a second child and were terrible parents that abandoned her on Jakku? None of these are great options in the long run and raise far more issues with even a modest amount of reflection compared to the concept of nothing special existing within Rey’s lineage and she herself has the ability to become special. Onto the production itself. While the bulk of the plot lines take place on one ship and one planet, when the film does change it up the results are great. Canto Bight appears as the Monte Carlo of the galaxy and gives the viewers a glimpse into how the richest spend their time. This insight also lets us see a seedy underbelly of the Star Wars mythos and answers a basic logistical question that I have had for a while. How do all of the ships get funded? Where are they getting them from? Well, as it turns out, even in a fictional universe there are war-profiteers. This proves to be simultaneously enlightening and infuriating. Likewise, the salt flat planet of Crait provides some of the best visuals in the entire film. Whether focusing on an assault on the planet’s surface with lines in the sand displaying ship movements so as to not confuse the viewer about the motion of the action, or when we follow the Millennium Falcon through an intricate cave structure within the planet, the visuals are stunning and fit well within a massive legacy of interesting locales. Now, no movie would be complete without faults and The Last Jedi certainly has those. The biggest one that was noticed was the humor. This has also been an issue with Disney’s Marvel films for a very long time. The humor brings everything leading up to it to a grinding halt so that they can tell a joke that may or may not land the way that it needs to. Seldom does the humorous dialog actually flow with a conversation. This leads to a jarring effect throughout the film. As much as The Last Jedi feels like a very complete film, certain scenes feel superfluous. A scene involving Chewbacca trying to eat dinner while being watched by horrified Porgs goes on for far too long. In fact, I really felt like the cutaways to the Porgs were happening too often. I understand that they are cute but they are doing nothing for the story. They are adorable set dressing and I’m sure their image being plastered on everything will make the shareholders a lot of money this holiday season. People have complained that some of the lines are cheesy. It’s Star Wars, not Shakespeare. I could pick apart every single line of each movie and find some good (gouda?) cheese. Have we forgotten the prequel trilogy and Anakin’s soliloquy on sand? That being said the, “Spark that will light the flame…” lines did seem to come up over and over throughout. I can almost forgive this due to the through line payoff in the end. Musically, what’s to say? It’s John Williams. I cannot recall a time that the man has not delivered on a film’s score but I’m sure I’ll hear about it in the comments. The opening crawl starts with the blaring of horns that have signaled something great to me since my childhood. The themes for Leia and Luke are present as are the newer themes introduced in the last episode. The music sets the tones perfectly, is never out of place and greats fantastic atmosphere. Is The Last Jedi the best Star Wars film ever made? That depends on who you ask. Many online are lambasting it as depressing and pointless. Critics are lauding it as a film truly worthy of the Star Wars moniker. That decision lies ultimately, as it would with any subjective experience, with you. But I place it pretty high. Resoundingly I say… See it in theaters!